When paranormal investigators give up on sciencey stuff, what's the alternative? The spiritual. 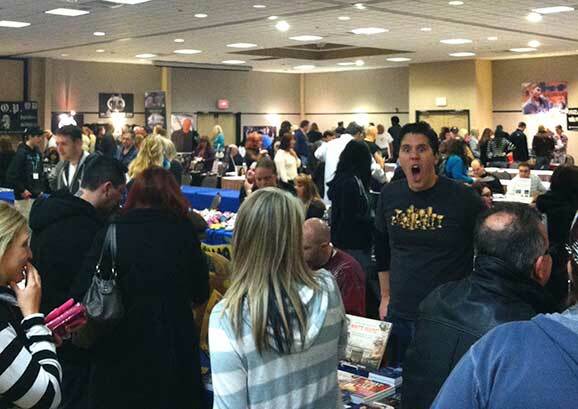 I take you on a tour of a recent paranormal convention. “Phenomenology 105” is an annual conference on the paranormal that took place this year, March 22-24, in Gettysburg, PA. Hosted by North Eastern Paranormal Investigations (NEPI), about 500 people attended the zombie-themed event that featured speakers, paranormal celebrities, panel discussions, ghost hunts, and zombie prom. What makes this type of event similar to skeptical, science, and secular-themed conferences is the sense of enjoyment in sharing a common interest, the free use of jargon particular to the specialty subject area, and interaction with people that everyone just knows. They also had a funny and personable emcee by way of Jeff Belanger. Participants were excited and enthusiastic. The differences from science/skepticism conferences, however, are considerable. You've never been to one of these conferences? Well, let me show you around. There are no professors. There are no suits. Instead, there are LOTS of black tee-shirts. Black tee-shirts are the stereotypical uniform of paranormal investigators. They really do wear them, emblazoned with their group's name and acronym. Entire families wear the same tee-shirt design. Yes, families. The age range at this event was wide. The youngest child was around nine and the oldest person likely over seventy. The median age was, if I had to guess, about forty. Ethnicity was not as diverse. At least half the attendees were women. However, this ratio did not hold for the speakers—I counted only four women among the forty or so presenters. There was no hint of or mention of sexism and no conduct policy. Everyone was courteous and friendly. But, I was not present later at the bar when alcohol entered the social mix. The vendor area featured merchandise ranging from ghost hunting implements to skull motif jewelry. This was also a meet-and-greet location to purchase autographs and pictures from authors and horror actors in attendance. The psychic reader didn't seem very busy. I asked about the parascope device that detects changes in static electricity by changing colors (pretty!). The seller demonstrated the response by placing his cell phone next to it. Also featured on this table were palm-sized geophones that lit up when nearby vibrations were detected. Great for lining them along a hallway to detect footsteps, he said. And, besides, they glowed in the dark. Cool. $90 a piece. With the many gadgets on display, I noticed the non-gadgets even more. Vendors were selling every kind of Saintly medal, rosary, chakra, and lucky charm you could imagine. There is a trend AWAY from the sciencey-sounding activities in exchange for a greater reliance on the spiritual. Another speaker noted this exact transformation in herself which I describe a bit later. I suspect the spiritual topics may have gained popularity beginning with the TV showParanormal State which aired from 2006-2011 featuring college kids investigating hauntings often associated with evil forces or demons. The leader, Ryan Buell, was a devout Catholic, interpreted the anecdotes and observations as demonic in many instances, even believing he had his own demon in pursuit. He consulted with demonologists. Now, several groups consider the demonic in their investigation scenarios. The use of protective medallions, religious symbols, and holy water have become more common tools. This religious orientation is also fueled by the success of the TV show Haunted Collector featuring John Zaffis, nephew of the Ed and Lorraine Warren, America's most infamous demonologists. The Zaffis family was the main event on the first night of the conference. The premise of the show is the family investigates items that are supposedly giving people psychic trouble. The blooper reel they showed was a huge hit with the loud, obvious fans sitting next to me. This was my first indication that this is very much a fan con. The content is often light, mostly consisting of a Q&A session with the para-celebs. While sometimes entertaining, I admit I do not like these Q&A sessions because of the dull questions repeatedly asked by the audience: What was the scariest thing that happened to you? What was your favorite place to investigate? I don't watch the shows much so that doesn't interest me. Many of these people are entertainers and they make their fans happy. Later, I got a chance to ask John Zaffis, an admitted “fan of all religions” how he reconciles all these different belief systems in terms of the clients' paranormal experience? What role does religion play? His answer was brilliant and enlightening: People must use the tools they have, including religion, to deal with their own situation. He can help them but they must do something on their own to feel protected. It did not matter what symbol they used—a rosary, a cross, a rabbit's foot—as long as it worked for them and they believed, that's what does it. He also noted in his talk that the sponsors, network and lawyers do not like when he does religious rituals. This is a touchy area. When I returned from the conference I checked in with some contacts who follow ghost hunting trends who assured me the shift from science to spiritual is a definite thing. Science has failed to give them the solutions (that they wanted) and so, they moved to a more “flexible” framework—whether New Age beliefs or traditional religion. Thus ended the first evening. These people were genuinely nice and fun to listen to with one caveat…I had to suspend my skepticism and rational thought and just listen. Friday was all day lectures. The first speaker, John Brightman, gave a presentation on the Bridgewater Triangle of Massachusetts, mainly the Freetown forest area. The area is perceived to be a hotbed of satanic rituals, hauntings, and UFO/Bigfoot sightings. Brightman correlated the events to the three mental hospitals in the area and an “Indian curse” based on a historic massacre. There were so many stories told (no references, no other evidence given) that it was very difficult to tell what was reliable. During the talk, he told of reported Thunderbird sightings in the Triangle while showing slides of pterosaur-like creatures portrayed during Civil War times. I immediately recognized the pictures as hoax photos related to a past TV show. But Brightman didn't mention that. He talked about the photos in the context that they were genuine! Perhaps he slipped on the descriptions but if he DIDN'T know these photos were faked, it would be impossible for me to take him seriously as an investigator. Later, in the vendor room, I decided not to bring up the mistakes he made but asked him about the “parascope” device he was displaying. He said the flashing colored lights are mainly for “entertainment value.” I think his stories are, too. Jason Gowin, formerly of the roundly criticized TV show Extreme Paranormal gave a humorous and honest presentation about his experiences as a ghost hunter and reality TV participant. Jason, who is an acquaintance of mine, is a funny, sweet person who sits in the middle of the paranormal belief sphere. He knows things are often faked and that he can be fooled but still wonders about terrifying personal episodes he can't brush off. He freely admits that you will come across many people who want to believe in the paranormal so badly, they will force evidence; many of the people who claim to have experienced activity are not mentally stable. Yet, he understands that people feel isolated when they have such experiences and just want someone to help them. “Comforting people is really where it's at,” he says. No longer under a non-disclosure agreement, Jason speaks out about his time on Extreme Paranormal. “Paranormal TV is entertainment,” he states. “They don't care about what's real or not or whether it's legitimate. Their job is to make a show people will watch.” Extreme Paranormal went down the toilet when they were directed to perform a blood ritual where one of the hosts cut themselves. Jason insisted this set a horrible example. He was ignored. To this day, he claims, he is vilified for his participation in a ruse he was not allowed to expose. The contract stated they would be fined for impeding production of the show. The show was cancelled. Getting your own TV show is a running gag at the event as the emcee, Jeff Belanger, freely joked about it. One successful show is Destination Truth with Josh Gates. He also has the show Stranded where normal people are put into abnormal situations. Gates also admits that many things are reenacted, condensed, edited, etc. The audience clearly loves Josh: he is charming, entertaining, and witty along with being quite brave to travel all the insane places he ends up (like Antarctica and Chernobyl). By the end of Friday, I had talked to a few people but was feeling more and more uncomfortable. The growing sense of unease was because my worldview was very far removed from all the people around me. And there were still two days to go. What's A Skeptic To Do? The day went downhill from there, as many of the speakers made mistakes that I could easily pick up. Factual errors, and not little ones either, continued to be common. The scholarship at these events is sorely lacking. References are second or third hand. Or nonexistent. Credentials are created. Dave Juliano of South Jersey Ghost Research sees his crew as “like doctors” to diagnose a situation. He teaches classes on this. One of Dave's points was about frame of mind—ghosts are drawn to anger, positivity gives you protection. This point was similar to one Michelle Griffin made later in the day when she described how “tools” and equipment of “scientific” investigation hindered her growth and experience. I took that to mean that she (and others) are over-reliant on perception, which is subjective and unreliable. There is that shift from physical to emotional evidence. They are opening themselves up wide to creating their own story as opposed to an objective description. The audience appeared to hear this as “getting in touch with your spiritual side,” that intuition and feelings were more powerful than anything. The person is the tool. Once again, some speakers just did Q&A, which was dull and to me showed a lack of preparation. Perhaps I missed an opportunity to ask some zingers but I didn't wish to reveal my secret skeptic identity. I just listened. Interesting bits were to be found as people chit-chatted waiting for the next person to set up. During one of these setup times, the speaker asked the audience if anyone had gone on a ghost hunt the previous night and how it went. There was some stirring in the audience. One woman, sitting with a male partner and a teen girl spoke up and said, “We had a problem.” She proceeded to tell how they had visited General Lee's headquarters when the teen girl experienced a choking sensation. Soon after, the man did too, and then the woman, as they all sought to get out of the place. They claimed to have heard a growl and interpreted their experience as encountering a malevolent force. Perhaps the General's spirit didn't want them there (they were Yankees). Or maybe, I thought, it was a growling stomach, anxiety, fear, and mass psychogenic illness. No alternative explanations were proposed. The story was too good. Everyone was aghast. I was too, for a different reason. By this time, I was tired. I had heard a lot that surprised me. A nice change that I thoroughly enjoyed was the zombie panel discussion led byParanormalPopCulture.com's Aaron Sagers. The panelists included radio personalities, paranormal investigators, and two zombie actors from The Walking Dead. Everyone knew their pop culture zombies and it was like being back at a monster discussion at Dragon*Con, the huge sci-fi/fantasy convention. The questions were great and the viewpoints insightful until someone in the audience suggested that vaccination is a possible way to turn us into a mindless horde because there are “toxins” in them. What a way to derail the discussion, lady. Sadly, she's the one who has been brainwashed. Belief in demons, astrology, chakras, etc., is more understandable than the idea that vaccinations are an evil government plot. Finally, the featured speaker on Saturday evening was Travis Walton, author, alleged alien abductee. I knew the general story about Walton's claims but not details of the critique. So, I just listened without prejudging—my goal for the weekend. Walton is a talented storyteller who has made relating the tale of his bizarre experience his life's work. I expect he's done okay through book sales, appearances and film royalties. He tells us he is redoing the book, Fire in the Sky, with additional information discovered and is attempting to get the movie (of the same name) remade more accurately. His story is dramatic, it draws people in. But, when he got to the part describing the technology on board the ship (this was in 1975), the obvious problem was the 1970's idea of technology that was depicted. It resembled the Star Trek or Star Wars flight decks. It was laughable. But, I didn't laugh. My conclusion at the end of his talk was that he likely had a frightening and confusing experience and was dramatically misinterpreting it. Upon later discussions with those who have more closely looked into the case, they told me they believe Walton's story to be a deliberate fabrication. Did the people in this audience buy the story? Maybe. They seem very open to believing anything that sounds interesting. I'd had all I could take. I was full up on the fantastic and simply could not muster the enthusiasm to attend the fourth and final day. I drove home, turning over all I had heard and seen from the weekend. There was no orthodoxy there. Everyone can do their own thing, then write their own book or get their own show. I felt this was worthwhile to see this from the inside. It is a worthwhile experience for skeptics to do this in order to understand how important FEELING is in these experiences, rather than THINKING. People are very affected; it's become part of who they are. We are the foolish ones who try to rationalize them out of a belief they did not rationalize themselves into.